A Hand-coloured print of a Baboo's dwelling in Chandernagore, from the Fiebig Collection: Views of Calcutta and Surrounding Districts, taken by Frederick Fiebig in 1851. The word Baboo (Babu) was a term of respect originally used to describe the Bengali aristocracy in Calcutta in the late eighteenth and early nineteenth centuries. Later it encompassed any person of distinction until finally it was used to describe Indian clerks who worked in British offices. 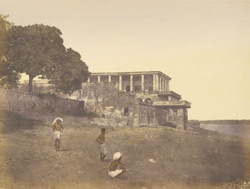 This photograph shows the house of a Babu in Chandernagore, 32 km from Calcutta, which was the site of the French East India Company's factory and remained under French rule until 1952 when a referendum made it a part of India.